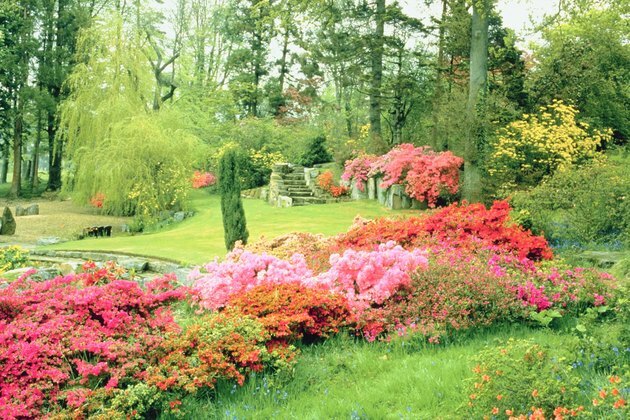 There is no right or wrong way to design a flower garden. Formal gardens often follow a classic design of angular shapes and uniform colors. The cottage garden is an eclectic grouping of plants with soft edges and curving borders. No matter which type of flower bed you choose, there are some things that are a constant. If you follow the key elements of gardening when you landscape a flower bed, your plants will be happy, healthy and pleasing to the eye. Even a shadowy corner of the yard can transform into a mass of color. The flower bed style could be formal, cottage, naturalized or a combination of all those. Boxwood hedges (Buxus sempervirens) that grow in U.S. Department of Agriculture plant hardiness zones 5 through 8 can add an evergreen border in the formal garden, but creeping phlox (Phlox subulata), grown in USDA zones 3 through 10, may be better suited to a cottage-style flower bed. Local sandstone works well as a border for a naturalized garden. Stately delphinium (Delphinium spp.) adds color and linear texture to a formal garden, while artemisia (Artemisia schmidtiana) provides a soft flowing hint of velvety texture to a cottage garden. Both grow in USDA zones 3 through 7. Trillium (Trillium grandiflorum), garden phlox (Phlox paniculata) and other native flowers provide color and texture to the naturalized garden, whereas rudbeckia (Rudbeckia fulgida) and echinacea (Echinacea purpurea) spray color out and upward throughout the season. Trillium and rudbeckia grow in USDA zones 3 through 9. Garden phlox and echinacea grow in USDA zones 3 through 8. Location is important when landscaping a flower bed. Your site should showcase the grouping of plants from the angle you want it viewed. Your plants should match up with the amount of sunlight the site receives -- shade plants for filtered sunlight and sun-loving plants for locations that receive six or more hours of sunlight each day. The soil should be a rich loamy mix that drains well. If you have problem soil, adding coarse sand will help with drainage, and peat moss will aid in water retention. Set the plants in groupings around the garden site. The plants should complement each other and not compete. This means that tall plants, such as the giant phlox, should go toward the back of a flower bed adjacent to the house or other structure. Circular or island gardens look best with the taller plants in the middle and the plants' height descending as they get closer to the outer edges. Groupings of three shrubs are aesthetically more pleasing than a single specimen. 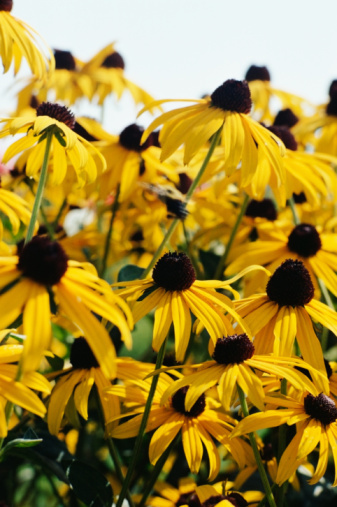 Single blooming flowers, such as the rudbeckia or echniacea, are visually stunning when planted en masse. Empty spaces can be filled with annuals to add color when perennials are not in bloom. View the flower bed from every angle to solidify the planting scheme. String, landscape spray paint or a garden hose work well to mark the outer border of the new flower bed. You can mark a straight border for a formal garden or add curves for informal, cottage or naturalized gardens. Once the border is marked, lift the sod from the area and work in any soil amendments. The soil should be tilled to a depth of about 8 to 12 inches. Transplant the new plants into the flower bed in the early morning to reduce transpiration in the plants. Water the plants until the moisture reaches the roots of the new plants. Keep the soil slightly moist until the plants acclimate to the new garden. Landscape artists and designers start with a sketch of the area that shows buildings, fences and other objects in the yard. You can use a sheet of graph paper to draw out the yard, and include the existing features in the sketch. This mock-up lets you include measurements of available space, speculate additional features and add notes about sunlight and soil conditions. You can use colored pencils to represent the colors of the flowers you have in mind so you can decide on color schemes before committing to the purchase. The mock-up helps you plan future gardens for the next growing season.